This ID bracelet is made of braided satin and is adjustable through a drawstring to fit wrists between 6 - 9 inches. Tag and balls at end of strings are 316L stainless steel. 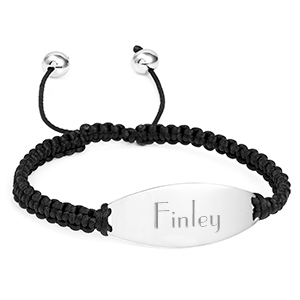 Engrave the front and back with a monogram, symbol, date, or message! Choose traditional (colorless) etched engraving for a more elegant look. Or, choose laser engraving that produces a darker mark that is easy to read from a distance.